What is Race Condition in software? Hello everyone, today we are going to see what is race condition and how we can use race condition in Software and also we are going to see few examples to understand better. What is race condition, we know that in a software the output that we get it depends on many events, if those events, those conditions are properly executed or properly run then only we get a proper output or as a proper expected output. But sometime what happens those events or are those conditions are not properly get executed or some of them may get skipped so that as a result we don't get a proper output as we expected, this is nothing but a race condition. You can hear this term in other systems also like in a electronic system or in electrical system this term race condition is also used. In other system also the meaning of race condition is same that is the output depends on sequence or series of events if a particular events does not happen then race condition occurs. If something is in use concurrently in multiple processes then result main get deflected. This race condition mostly occurs when a particular thing is concurrently used for multiple processes and it can also be occur when one thing is used for multiple things, to understand this, let's consider the following example. Considered there is a variable A whose initial value is 5, this A variable being used in method Y and method x. Method y will add plus one variable A and method X will multiply the value of a by 2. Initially method y will start first and after the execution the value of A becomes 6. Let's considered method x started being a variable A while method Y was running. Show the output of method x will be 10. So if this two methods executed simultaneously and continuously then the result that we should get will not be a proper one as both running simultaneously. So overcome this there is a 1 solution which is called locking, locking is nothing but locking the current processes are variable, to understand this locking in detail let's take the example that we have mentioned above, we will look the same example by using the looking solution. 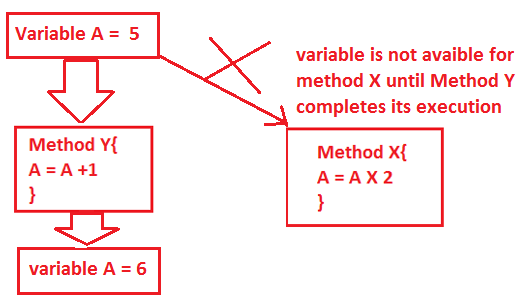 See the following image, the variable A is available for only one method at a time. 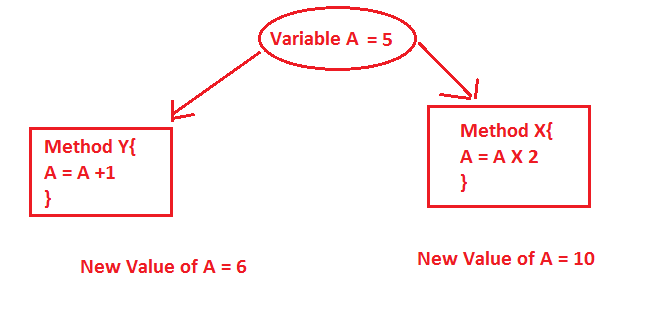 Like in the image when Variable A is being used by method Y then that variable cannot be available for method X means that variable A is locked. 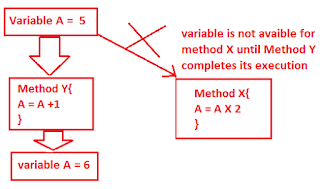 Method X can access the variable A when method Y complete its execution. 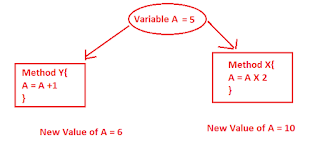 Sometime the case might be different if method X executed before method Y then variable A is locked for method Y. The race condition can be overcome by locking solution. It's actually stop the concurrent and multiple use of the things, one thing only be executed once. The same thing cannot be concurrently use if it is locked by the lock solution.